It seems her father wanted her to marry, but when she refused the intended, fled but was beheaded by Carodoc. She was healed by Beune and dedicated her life to God in a convent. 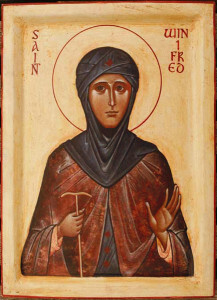 The story about St Winifred of Holywell (in Welsh Treffynon) in Clwyd, north Wales is that a would-be suitor, when informed she was engaged to another (Christ? ), cut off her head. A well sprang up (see image) where it hit the ground. But, her uncle, St Beuno, came and put her head back on again. She became an abbess at Holywell with eleven other virgins who came to join her there. Patrick Duffy tells her story. The account of the life of Winifred date from about five centuries after her death and seem to work back from the famous spring associated with her. One of the accounts of her life was written by Robert, Benedictine prior of Shrewsbury, when her relics were transfered there in 1138. It seems her father wanted her to marry, but when she refused the intended, the son of a neighbouring prince called Caradoc, in rage at the refusal, pursued her. She fled to her uncle – St Beuno – at his chapel, but before she could enter it Caradoc cut off her head. A fountain sprang up where her head touched the ground. Her uncle Beuno came out from the chapel and cursed Caradoc, who immediately melted in his presence like wax before fire. Beuno put her head back on her body and prayed. 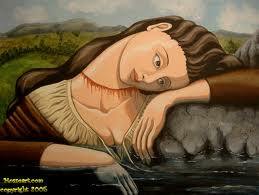 The body received back the soul with only a thin scar showing at the neck. One account has it that Winifred was abbess of a convent at Holywell where eleven other virgins joined her. Another was that after visiting other places she settled at Gwytherin under the direction of a St Eleri, where after her death her relics were enshrined before being brought to Shrewsbury in 1138. St Winifred’s Well was an important centre of pilgrimage in the middle ages with cures reported up to the present day. Henry V gave thanks there for his victory at Agincourt. Lady Margaret Beaufort, mother of Henry VII, had a two-storey chapel erected to enclose it. The Jesuit mission named after St Beuno had a presence there during penal times. In 1917 the well ran dry due to mining in the area but was soon restored. 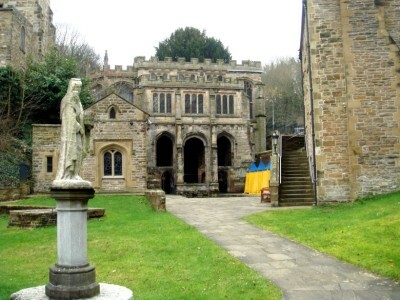 The town of Holywell website advertises it as “the Lourdes of Wales”.